So far I’ve interrogated interviewed Rebecca Bryn: http://bit.ly/1XYWbtF, Thorne Moore: http://bit.ly/1P6zDQh , Matt Johnson: http://bit.ly/1RUqJFg , Christoph Fischer: http://bit.ly/1svniAr , Sally Spedding: http://bit.ly/1VNRQci, Wendy Steele: http://bit.ly/1PMoF8i ,Kathy MIles: http://bit.ly/1twN3Bg , Carol Lovekin: http://bit.ly/1Y2z6HT, Colin R Parsons: http://bit.ly/1tvBc5G and Lisa Shambrook: http://bit.ly/28NMI5v: And thanks to Thorne Moore for interviewing me: http://bit.ly/1VTvqGq Over the next few weeks I’ll be introducing the rest of the authors and I’ll also be showcasing the publishers who will be in attendance. There may also be a short chat with John and Fiona of http://showboat.tv/ who, as usual, will be filming the event. Hi Alex, welcome, and thank you for being here today to let your readers learn a little bit more about you and your brilliant books. Lovely to be here, Judith. So, a favourite question of mine, what were you like at school? What were you like at school? Interesting question. So long ago it’s hard to remember! I was the joker in the pack, sporty and a team player. Strange, as I’m relishing being a writer hermit these days and letting the world go hang. I wanted to stay on in school but it changed from being a grammar school to a secondary modern just as I was taking my O Levels and the teachers either went off sick or drank themselves to death – well, one did – the English teacher. I wore black and was summoned to the Head’s office to explain my refusal to wear the new uniform. My answer: “I’m in mourning for my education.” Parental support wasn’t forthcoming to study for A Levels and go to university so I worked from the age of seventeen as a secretary. I did some interesting jobs, working for a publisher of children’s books, an industrial catering company, a legal firm and the last of which was personal assistant to a CEO of an agricultural consultancy firm working in third world countries. So I wouldn’t say I hadn’t been well educated, just did it my own way. Yes, I loved it. Loved writing essays, chewing my pencil, thinking up bizarre answers to straightforward subjects. Hated reading aloud; still have a hang up about that despite singing in musical productions. Read voraciously on rainy days. To earn a decent living doing what I love. So many! Randomly, from the top of my head: EM Forster, Jane Austen, (obvs as they say these days), Winston Graham, Kazuo Ishigouro, Audrey Niffenegger, Thorne Moore, Judith Barrow (! ), Joanna Trollope, GK Chesterton, Laurie Lee, Dorothy Dunnett. Shakespeare’s not bad. If I include my next one, which is in the last stages of editing and I’m really excited about, five novels and a collection of three short stories. 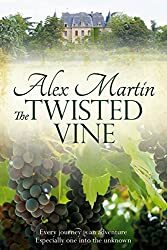 The Twisted Vine (http://rxe.me/89M2TSM) was my debut book and partly autobiographical. It’s set in deepest rural France in the 1980’s. Roxanne Rudge escapes from a disastrous relationship by going grape-picking in France, despite not being able to speak much French. She meets a sinister Frenchman there and uncovers his devious plans to claim his inheritance of a beautiful chateau she’s working in. She finds romance but even that isn’t straightforward. Many twists and turns along the way ensure that Roxanne faces her fears and finds her true self. Daffodils (which can be found at http://rxe.me/BPUQAY4) is book one of The Katherine Wheel Series, currently a trilogy but a fourth is mapped out in my head. It’s entirely different to The Twisted Vine and, without meaning to, in writing about the sleepy village in Wiltshire where my kids were born, I got drawn into the global drama of World War One. The research took me ten years, off and on, and both moved and humbled me. I got fascinated with the role of women at that time and began to understand that it was this generation that was the vanguard of the feminist movement today. Women drove trains and buses, swept the streets and emptied the dustbins. My lead character, Katy Beagle, once a frustrated, restless maidservant at Cheadle Manor, ends up working as a mechanic for the WAAC on the frontline in France. Her journey is an emotional one about a marriage suffering under the strain of scandal, bereavement and the epic scale of that conflict. Then I, like my readers, wanted to know what would happen to the rest of the cast in Daffodils after the war ended. The research for the sequel, Peace Lily, was no less chastening, as the rulers of the rigid order at home wanted to restore the old class system that had held sway for generations in rural England. 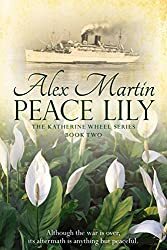 Katy, ever one to break down barriers, isn’t ready to settle for returning to domestic service and finds an ingenious way to start a new life in Peace Lily (http://rxe.me/O694ET4). Both stories follow the aristocratic side of life during this tumultuous time through Katy’s boss, Cassandra Smythe. I wanted to see how the dynamic with the haves and have nots changed through this short era of upheaval. 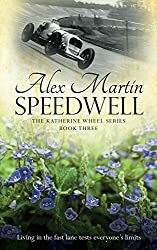 In Speedwell, (http://rxe.me/ZWS6UG) Katy, now the proud owner of a struggling garage, hits upon a life-changing idea and explores it, with the aid of Cassandra’s American husband, Douglas Flintock, in the exciting arena of motor-car racing in the 1920’s, with unforeseen consequences. There’s a lot in these books – it’s hard to summarise them! The final one, still in the planning stage, will be Woodbine and Ivy which will follow the lives of the next generation through the war that defined them, World War Two. My latest book, The Rose Trail, is different again; different genre, the paranormal, and an entirely different cast of characters. It is partly set in the modern day, partly in the turbulent time of the English Civil War. An atmospheric manor house is at its heart. It’s again set in Wiltshire, where I grew up and climaxes in a battle that really took place there. My collection of short stories are all modern. Some are sweet, some are really quite sour. Every reader of my novels is entitled to read them for free. I write in my garden shed – see http://www.intheplottingshed.com/ where I use my laptop until the battery fades. On really good writing days I scuttle back up the long garden path and plug it in to recharge while I quickly scoff some lunch and then hurtle back before the muse deserts me. I’ve got some heat and light in there but it’s off grid so I’m not distracted into browsing or doing social media on the Internet. I’m very easily distracted! I have a view of the Welsh mountains which invigorate a flagging imagination very well. On the walls I pin mind maps, real maps, bits of research, cast of characters, their physical appearances, and their many foibles. I’m not sure I did. It chose me. As soon as I started reading, which I adore, and got lost into another world, the decision was made. Took many, many years to manifest my own work but I’m loving it. I write because I’m a restless sort of person and very curious about everything. If I don’t channel that energy into something creative, I’m not much fun to be around. And it’s a fantastic way to explore other worlds, other realities, other lives. A major breakthrough came when I realised that you shouldn’t ‘write’ at all. Now, I have my various rituals – light a candle, short meditation, fiddle with pens, write in my journal – and then I go into the character. I become the character. It’s then like watching a video. Because I am them – and that goes for the rotten ones too – I live their story and it flows out through my fingers on to the keyboard. It can be quite exhausting. Research stalls this process quite often – oh, and real life sometimes – and then I have to absorb the facts I’ve learned into the scene, so they become the scene. Does that make sense? I have a firm concept of each cover, even before the story is written. I work with plants in my day job – I’m an aromatherapist – so I wanted plants to be involved somehow, as they are so much part of me and it’s become a brand, with each title having a plant in it. For Daffodils, I searched for many days to find a picture representing women in WW1 that wasn’t subject to copyright but when I did find the one of WAAC girls on the beach at Etaples, France, exactly at the time Katy was there, a huge tingle went up my spine. It’s called Daffodils because ultimately the book is about hope, encapsulated by springtime, after the darkest, blackest of winters. On a personal note, it is also a nod to my Mum, who was born on the first day of spring and died around her birthday, when I completed the book. I kept fresh daffodils in her room until it was over. The others just followed from there. Peace Lily was the only plant I could find with peace in its name but its morphology is so appropriate for the subtext about sexual boundaries. Speedwell, as well as its joyous blue colour, so typical of the 1920’s, was an obvious choice for a book about racing cars. The Twisted Vine evokes the elegance of the French chateau at its dark heart and grapes had to be depicted! Jane Dixon Smith of www.jdsmith-design.com put it all together for me with her usual professional panache. I’m just putting together some ideas for The Rose Trail cover. I want it to be radically different from the others and I know Jane will steer me into getting the branded look right. A background a bit like this perhaps; it’s a creepy story and I want the cover to reflect that. Thank you, Alex for sharing this with us..
And thank you Judith for inviting me. I always enjoy chatting to you. This entry was posted in authors, blogging, Books, contemporary womens'fiction, Interview with authors, Interviewees, interviews, Tenby Arts Festival, tenby book fair and tagged #blog, #women, #womenauthors, #womenwriters, #womenwriting, authors, books, historical, Tenby Arts Festival, tenby book fair by Judith Barrow. Bookmark the permalink. 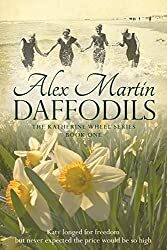 A wonderful series with Judith Barrow as she interviews authors attending the Tenby Book Fair..meet Alex Martin author of books including The Twisted Vine, Daffodils and Speedwell. My pleasure Judith..will keep up with the series the best I can over the next week or so.. on my short list to check every day.. Enjoy the rest of the weekend.. love and hugs. Sally, thank you so much for reblogging Judith’s interview with me.It is very much appreciated. I do hope you are tempted to open the cover and look inside at the story. Your books look great Alex and look forward to reading this in the future.. Thank you very much Christoph for reblogging this. Much appreciated. What lovely comments from people! Always nice to get some feedback and reach new readers. Great to meet you all and thanks for reading Judith’s interview with me. Thanks, always, to Judith.